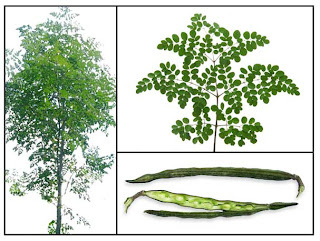 Moringa Oleifera or "The Miracle Tree" is an exceptionally nutritious vegetable tree with a variety of potential uses. It is widely cultivated in Africa, India, Indonesia, Malaysia, Mexico, Philippines, Central and South America, and Sri Lanka. Moringa Oleifera is considered to be one of the world’s most useful trees, as almost every part of the tree can be used for food or has some other beneficial property. In the tropics, it is used as forage for livestock, and in many countries, moringa micronutrient liquid, a natural anthelmintic (kills parasites) and adjuvant (to aid or enhance another drug) is used as a metabolic conditioner to aid against endemic diseases in developing countries. In the latest episode of the American Chemical Society's (ACS) award-winning "Global Challenges/Chemistry Solutions" podcast series, the podcast describes how the seeds of the "miracle tree" can be used to produce clean drinking water. A natural substance obtained from seeds of the “miracle tree” could purify and clarify water inexpensively and sustainably in the developing world, where more than 1 billion people lack access to clean drinking water, scientists report. Research on the potential of a sustainable water-treatment process requiring only tree seeds and sand appears in ACS’ journal Langmuir. The new water-treatment process requiring only tree seeds and sand could purify and clarify water inexpensively and sustainably in the developing world, where more than 1 billion people lack access to clean drinking water, scientists report. Removing the disease-causing microbes and sediment from drinking water requires technology not always available in rural areas of developing countries. For an alternative approach, scientists looked to Moringa oleifera, also called the "miracle tree," a plant grown in equatorial regions for food, traditional medicine and biofuel. In the podcast, Stephanie B. Velegol, Ph.D., a researcher at Pennsylvania State University, explains that past research showed that a protein in Moringa seeds can clean water. One approach creates water that cannot be stored, and the other approach is too expensive and complicated. The researchers wanted to develop a simpler and less expensive way to harness the seeds' power. To do that, they added an extract of the seed containing the positively charged Moringa protein (which binds to sediment and kills microbes) to negatively charged sand. The resulting "functionalized," or "f-sand," proved effective in capturing lab-grown E. coli and damaging their membranes. The f-sand was also able to remove sediment from water samples. The results open the possibility that f-sand can provide a simple, locally sustainable process for producing storable drinking water, Velegol says.